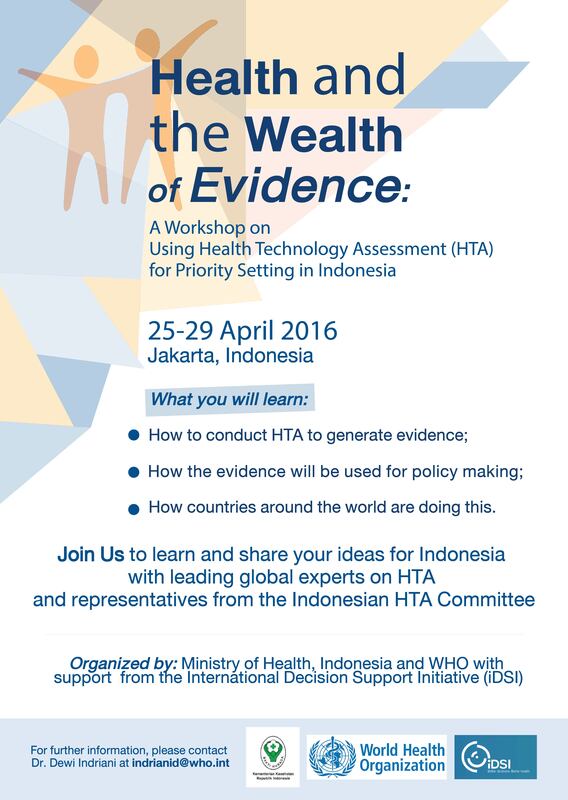 The Ministry of Health, Indonesia, and the WHO, with support from the International Decision Support Initiative (iDSI), are organising a workshop titled “Health and the Wealth of Evidence: Using Health Technology Assessment (HTA) for Priority Setting in Indonesia” from 25th to 29th April, 2016 in Jakarta, Indonesia. During the workshop, participants will learn about how to conduct HTA, how evidence is used for making policy decisions and how HTA is done in other countries. The workshop is free to attend. Participants will be selected by Indonesia’s HTA Committee and the WHO from select universities and relevant units within the Ministry of Health. Although the workshop has a targeted audience, anyone interested in learning more about the workshop or HTA in Indonesia can contact Dr Dewi Indriani by emailing indrianid@who.int. The event flyer is available here.